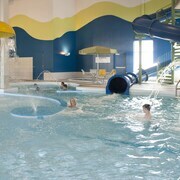 In addition to a complimentary water park, Fairfield Inn & Suites by Marriott Winnipeg features a waterslide and an indoor pool. A computer station is located on site and wireless Internet access is complimentary. This 3-star property offers access to a 24-hour business center. A complimentary breakfast is offered each morning. Event facilities measure 1722 square feet (160 square meters). An area shuttle within 5 km and a roundtrip airport shuttle (available 24 hours) are complimentary for guests. This family-friendly hotel also offers a children's pool, a spa tub, and a fitness center. Limited complimentary onsite parking is available on a first-come, first-served basis. 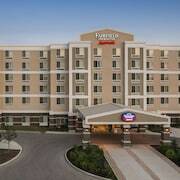 Fairfield Inn & Suites by Marriott Winnipeg is a smoke-free property. This family-friendly Winnipeg hotel is located in the entertainment district, within 2 mi (3 km) of Polo Park and University of Winnipeg. MTS Centre and RBC Convention Centre Winnipeg are also within 3 mi (5 km). Free water park access, an indoor pool, and a fitness center are available at this smoke-free hotel. Free buffet breakfast is provided, as well as free WiFi in public areas, free self parking, and a free airport shuttle. Other amenities include a spa tub, a 24-hour business center, and coffee/tea in a common area. All 166 rooms provide conveniences like refrigerators and microwaves, plus free WiFi and flat-screen TVs with digital channels. Guests will also find MP3 docks, coffee makers, and down comforters. This property is undergoing renovations from 01 April 2019 to 30 June 2019 (completion date subject to change). Fairfield Inn & Suites by Marriott Winnipeg offers 166 air-conditioned accommodations with MP3 docking stations and complimentary newspapers. Beds feature down comforters. Guests can make use of the in-room refrigerators, microwaves, and coffee/tea makers. Bathrooms include shower/tub combinations, complimentary toiletries, and hair dryers. Guests can surf the web using the complimentary wireless Internet access. Flat-screen televisions come with digital channels and pay movies. Additionally, rooms include complimentary bottled water and irons/ironing boards. Housekeeping is offered daily and hypo-allergenic bedding can be requested.